With Genius Scan, you can protect your documents with a passcode or with your fingerprint if Touch ID is available on your device to prevent people from accessing your data too easily. Note that we strongly recommend that you also set a passcode on your phone. Open the settings and enter the General section of the settings. Enter the passcode as requested. 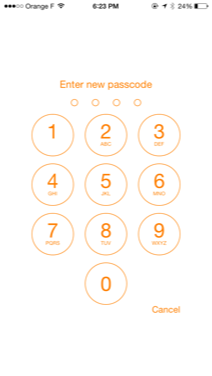 Even if you have Touch ID, a passcode will be used as a fallback in case your device cannot read your fingerprint. Genius Scan will now authenticate you every time you open the app. 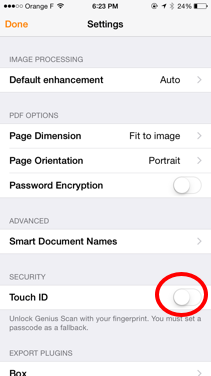 To disable the passcode protection, go back in the settings and turn off the Touch ID/passcode switch. Note that you will need to authenticate yourself to disable this protection. How can I protect my documents with a password?